To make the stuffing, mix all the ingredients (except the pork) in a large bowl. 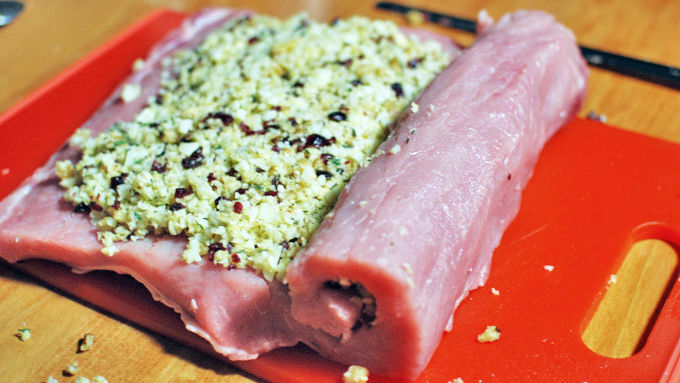 Lay the pork loin on a large cutting board with the fat side up. With a sharp knife parallel to the cutting board about 1 inch high, start cutting into the pork. 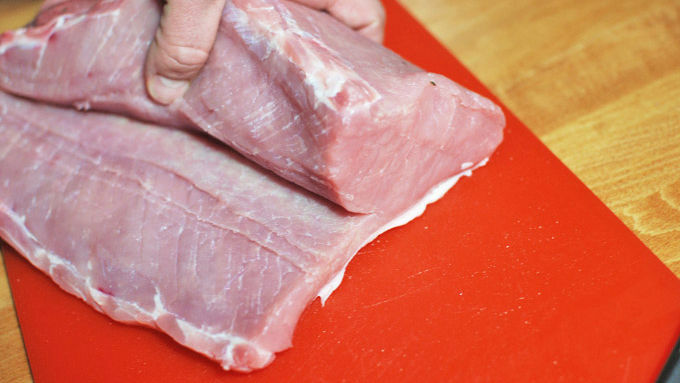 Continue to cut, and as you make the cut unroll the pork so that you end up with a long 1 inch rectangle of meat. Salt the pork and fill it with the stuffing. 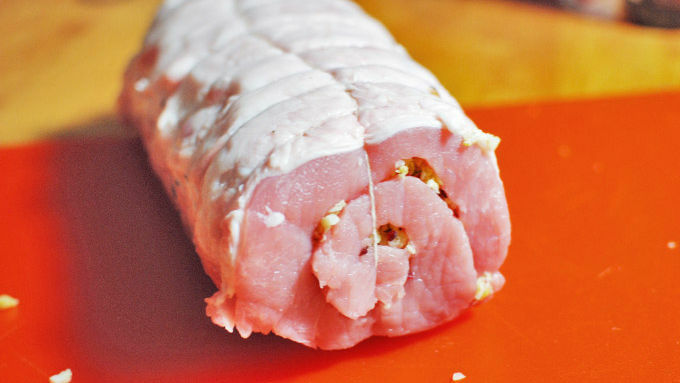 Roll the pork back up so that it is back to the original form with the fat on top. Use butcher’s twine to seal and secure the pork. Roast at 400°F for 45 minutes, and then turn the oven down to 350°F. Cook another 45 minutes to an hour, continually checking the temperature until you reach 150°F at the center. Impress your guests with this delicious showstopper of a meal. 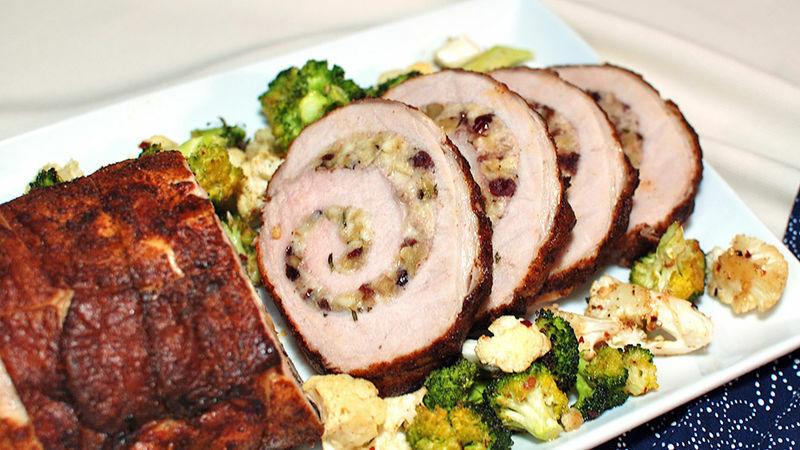 Pork loin has a reputation for being a little dry, but when you stuff it like this it stays super juicy and flavorful. This dish looks like a lot of work, but it is actually not too hard. The final presentation is really impressive and looks like you worked away for hours! The trick here is to butterfly the pork loin. This basically means to open it up like a book so it lays flat on the table. Once you do that, you pop in the stuffing and roll it back up into its original shape before popping it into the oven. The stuffing is a nice salty and tangy mixture of manchego cheese, cranberries, walnuts and some thyme. A quick rub of taco spices on the outside, and it’s ready for the oven. Juicy delicious pork with that savory cheesy goodness spiraled throughout. This pork is a showstopper on any table!